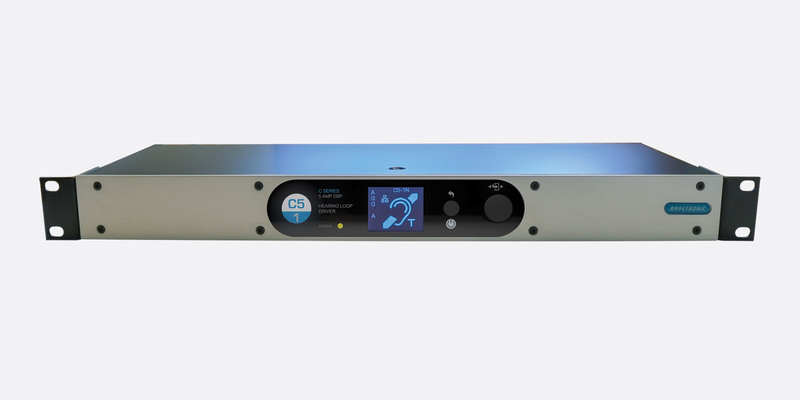 Ampetronic C5 and C7 series hearing loop amplifiers have been designed with Class D drivers to aid ‘low running and maintenance costs’ in locations such as lecture theatres, conferencing facilities, stadia, sports halls, cinemas, theatres, court rooms and transport stations. 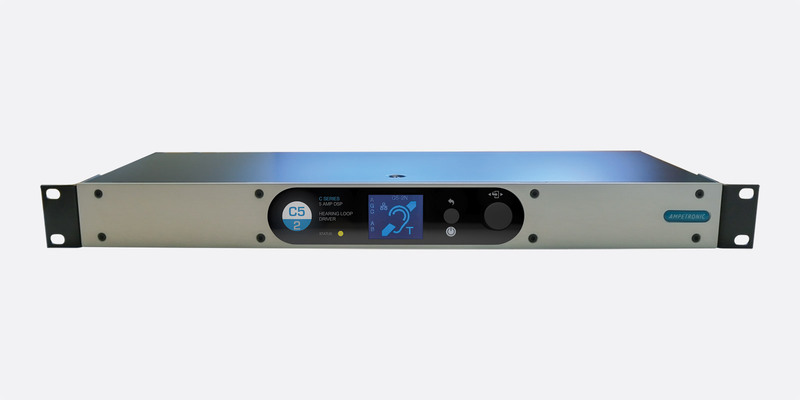 The C5 and C7 range of amplifiers are also available in single loop or multi-loop configuration and have been optimised for ‘speech frequencies’ along with ‘musical reproduction’. These 1U rackmount induction loop amplifiers have also been designed to be easy to set up using local control or networked control for applicable models. In-built test tones and automatic gain control also aid setup time. The network controllable versions, denoted with ‘N’, allow remote control and monitoring of amplifier functions including condition status, resistance and induction measurements, and fault alert via email or Telnet. The front facing panel has a central LCD display screen that shows model ID and configurable network name when idle, or menu and setting values. A push button allows the user to initiate power when pressed for a short period, or return to home screen with a short press. A rotary and push button allows menu navigation and selection whilst the amplifiers status is shown via a tri-colour LED with normal operation (solid green), sleep or standby mode (flashing green), error (flashing red), or firmware updating (flashing amber) indications. The rear facing panel host all input and output connectivity including inputs via 3-way 3.5mm Euroblock screw terminals, switchable mic/line level; 100V line input via 2-way 5mm Euroblock screw terminal, loop connectors via 4-way 5mm Euroblock terminals, DC output via 2-way 3.5mm Euroblock terminal, and line output via 3-way 3.5mm Euroblock screw terminals. 230V AC, 45-65Hz power input is by way of 3-pin IEC connection. A latching phantom power switch allows the user to apply 24V to both inputs of the amplifier. A USB input can be used for firmware updates or to power an external wireless router with a limit of 200mA current. Networkable models have an RJ45 Ethernet connection for connecting to LAN or external wireless router. Note 1: At maximum output current per channel. 2: Per channel, RMS. 3: 1kHz sine at full current. 4: Width x depth x height, mm. It is recommended strongly that before purchasing any of these systems, the purchaser makes use of the Ampetronic design or review facilities. Please contact Technical Support for assistance.